Jim Hanlon is a 40-year veteran of the Canadian tech industry, having worked in design, marketing and management for companies in Atlantic Canada, Ontario and New England. Over the years, Jim has worked in senior management positions with several large publicly traded multinationals spanning the aerospace and defence sectors, as well as the marine environmental monitoring field. He has also owned two separate high-tech companies that have successfully grown and been purchased by multinationals. Until February of 2012, Jim was the President of Ultra Electronics Maritime Systems in Halifax, NS. The Centre for Ocean Ventures & Entrepreneurship (COVE) is a hub of activity for start-ups, ocean technology businesses, and organizations across Canada and overseas that is strategically located on the Halifax harbour with access to the ocean. The space includes a mix of short and long-term workspace to support businesses with access to a range of services and shared infrastructure. The programs, facilities, and services offered through COVE bring the ocean technology cluster to advance the competitive position of members in the global oceans industry. 1- Although Canada has the longest coastline in the world, it is a small ocean economy because of geographic, historical and economic reasons. Only 1% of our national GDP is ocean-industry related. In comparison, the OECD average is between 2% and 5%. 2- Canada’s skills in terms of ideation and fundamental research are strong, but the government should develop programs that also provide support to tech companies’ sales and distribution departments in order to commercialize our innovations. 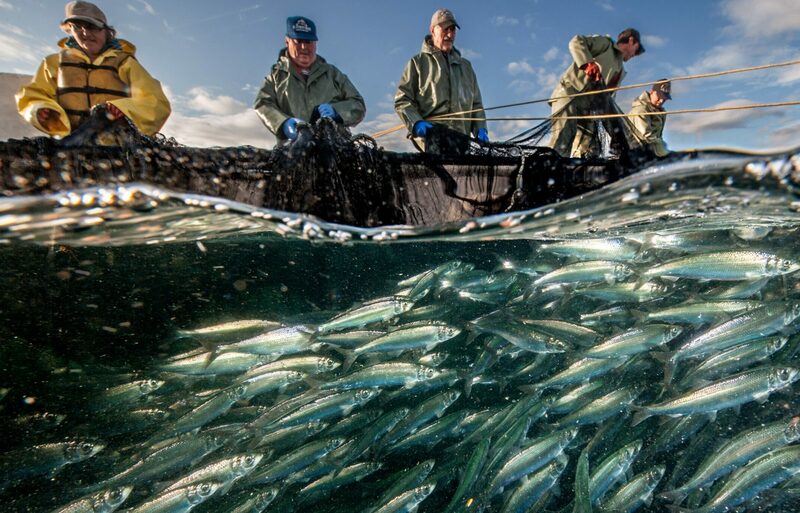 3- The imperative to provide protein for a growing global population of 7 billion makes the application of disruptive science and technology to Canada’s labour-intensive ocean food sector one of our biggest opportunities in the future ocean economy. To all the investment firms on Bay Street in Toronto, consider the opportunity for investment in disruptive innovation in the ocean economy, especially using science and biotechnology. How competitive is Canada in the global ocean economy? Geographically, we have some God-given advantages. Canada has the world’s longest coastline and the fourth largest ocean territory. We are also blessed with world-class research and post-secondary institutions specializing in ocean science, technology and business. Particularly under the current government, we have really good public support for science and technology commercialization. The Ocean Supercluster and the Ocean Frontier Institute (OFI) have been set up to specifically strengthen and expand our ocean economy. However, one of our challenges is that we are a relatively small ocean economy. The view that Canada is an ocean nation is true by geography, but not by economy or population distribution. Two of the largest cities in the country, Toronto and Montreal, are 1,000 km or more away from the ocean. As a result, only about 1% of our national GDP is ocean-industry related. In comparison, the OECD average is between 2% and 5%, with countries like Norway scoring as high as 25%. So, we have an underperforming ocean economy given the geography and natural assets that we have. A lot of our coastline and ocean territory is in the Arctic, where at least in the short term it is really difficult to do very large-scale economic development. Canada cannot realistically aspire to be the largest ocean economy in the world because much of our Arctic ocean is inaccessible from a business development point of view. Another challenge for Canada is that we lack alignment in R&D between government, academia, corporations and small and medium sized tech companies. In Canada, we do a lot of ideation and fundamental research in academia and in the government, but we fail to get that through to market. We need to go right back to the start of that equation and conduct more strategically targeted research. As a small country with a small economy, if we push our curiosity-driven research agenda across the broad spectrum of science, we will very seldom have any impact or commercialize. We need to fund pure research in certain strategic areas with Canadian end-use in mind and then let the commercialization happen. Twenty years from now, my hope would be that Canada will be a world leader in the use of advanced technology to protect the ocean and extract resources from it at the same time. Technologies that are high impact and not labour intensive such as robotics and remote sensing will be Canada’s USP. What are Canada’s biggest opportunities in the ocean economy? 90% or so of the global ocean economy is made up of marine transportation, marine tourism, energy from the ocean, defense and security, and food from the ocean –constituted of traditional fishery and aquaculture. Canada has significant corporate presence in all those sectors. In 2016, the OECD published a report that estimated that the total global ocean economy is worth US$1.5 trillion and it will double in 2030. This outpaces the general global economy by a factor of about 20%. So, the ocean economy is growing very rapidly, and thus is a great place for Canada to invest. Canada already has a significant presence in the ocean economy, particularly around the R&D and technology side of things. In terms of new investment and promotion, we need to increase our focus on one area of the ocean economy and grow it. We are already well invested in defence and energy, in my opinion. The industry I am most fascinated with is food. Traditionally, the food sector – capture fishery in particular – has been a light user of science and technology; it has been a muscles and brawn industry. It is just old tech, old boats and lots of people. That is changing rapidly. A modern fishing vessel is equipped with highly sophisticated means of identifying the right species of fish and reducing wastage. Canada has corporate headquarters for companies like Clearwater and Cooke, so we have the ability at the boardroom level to make a very strategic impact on the global fishery and aquaculture sector. Companies in that sector are very sensitive to the environmental imperative. Commercial fishing companies and aquaculture companies are as fearful as the most passionate environmentalists about the sustainability of the food source and the ocean economy. So, they are really hungry for more informed business information that will help guide their extraction of this key food resource from the ocean. There is no way we will continue to feed 7 billion people and more without a fundamental increase in the amount of seafood we take out of the ocean, whether it is capture fishery or aquaculture. It is the only efficient way to feed the global population; you cannot do that with land-based protein. If I was an investor, I would be particularly interested in the disruptive application of science and technology in the ocean food sector. I am a twice-over ocean tech entrepreneur myself, so I have built companies and sold them internationally. The critique of a lot of the Canadian ocean tech companies is that they exit prematurely without scaling up. While that is legitimate, there are solid reasons for this phenomenon. Many of the government’s small business incentive and support programs hyper focus on innovation through technology, designing a new product or adopting new science. Although new R&D is necessary , a lot of small and medium tech companies end up with a very large portfolio of government-supported inventions that they cannot commercialize. Fundamentally, they lack sales capability and so end up selling out to a big company – often from another country – that’s attracted by their IP portfolio. So, my recommendation to the government would be to develop programs that also provide support to tech companies’ sales and distribution departments, instead of just to their scientists and engineers. This will help our existing companies to scale faster and larger before exiting. Another problem we have is that we are using the number of start-ups as the only metric for innovation. While we do need start-ups, they need to be high quality and survive in the market. I do worry that this plethora of incubators and accelerators that are popping up in every major city in the country are too incentivized with public funds to just get quantities of start-ups without enough focus on quality. In contrast, private equity and venture capital are really vicious when it comes to picking the start-ups they invest in since 90% or more of them are not investible. How will COVE work to develop opportunities to grow the future of Canada’s ocean economy? COVE is a physical facility – it is brick and mortar. We can virtualize a lot of things in business but there is still no substitute for face time in my opinion. So, we have a lot of programming activities built into COVE that maximize the opportunities for social gatherings, demonstrations and networking sessions. We’ll virtualize and extend that impact to outlying areas where we can, but face-to-face still matters. COVE is trying to bring in tangible contracted projects for a consortium of companies to work on together. So, we urge companies that, in and of themselves are either too small or too focused on their niche, to come together and build a larger product. COVE is adding the systems engineering, the project management, the strategic marketing and the sales to build projects that can be delivered to a bigger customer that would otherwise be inaccessible to small companies. How are we doing in terms of educating, training and up-skilling the talent needed to develop our ocean economy? Firstly, and surprisingly, the majority of companies are looking for the people skills such as communication, teamwork, persuasion and negotiation. Even by international standards, Canada produces good science, technology, engineering and mathematics (STEM) specialists. There is no question that our post-secondary institutions are really good at training in those technical skills. But, it is the people skills that are missing in our STEM curricula, so we end up with really skilled engineers who cannot commercialize their product or service and transform it into a business. They are textbook trained in answering well defined questions and filling in equations, but are unable to ask the big picture, strategic questions. I would argue that some of the big American STEM schools are better at that. Secondly, very few companies want to hire a fresh graduate, partly because of the investment required to bring them up to profit-producing employment. We need to reform our post-secondary curricula so that five years of work experience is built into them. Graduates should leave their institution with business experience through co-ops, internships and lots of industry interaction and participation. How can we reconcile growing our ocean economy with our duty to protect Canada’s marine environments? Ocean pollution is a bigger problem than terrestrial pollution because the ocean moves and has no boundaries. Moreover, the science on ocean pollution is still young, so anything we do is ill informed. The biggest concern I hear from the leaders of the ocean industry is, “We cannot afford to damage the ocean because that is where we make our money.” But, they need better guidance from the science, which currently cannot give them accurate predictions of the future. The big one that we deal with more than anything else right now is the effect of climate change, specifically how ocean temperature and acidification affect the movement of fish. Let’s say I am a fishing company operator and I have infrastructure such as factories and fishing boats in a certain location. If all of a sudden the fish species that my business depends on is not at that location anymore, it really hurts from a business point of view. There is without a doubt a time and place for government regulation because that sets the standard. But, I do think that has to be done in cooperation with the industry for a bunch of very pragmatic reasons. The ocean is a very expensive environment to operate in, so conducting measurements or creating models to support informed ocean regulation is quite costly. No one entity, whether it is the Canadian government or any industry, could do that on its own. One of the key underlying assumptions with the Ocean Supercluster is that the best way to do macro measurement, regulation or prediction is as a team. That team needs to include the likes of Fisheries and Oceans Canada (DFO) and Environment and Climate Change Canada (ECCC), as well as big industry leaders and smaller ocean tech enablers.